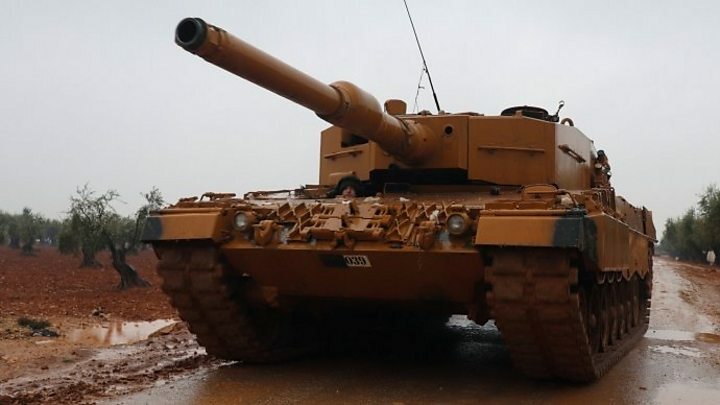 The German government is facing calls to halt arms exports to Turkey after reports emerged that German-made Leopard tanks were being used in an offensive against the Kurdish YPG. Some German politicians have requested that any moves to approve a tank upgrade deal be halted. 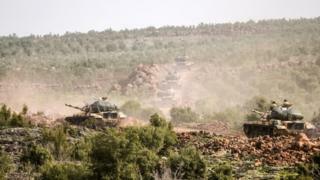 Turkish-led forces began an assault in Syria's north-west on Saturday. The row comes just weeks after the two countries' foreign ministers vowed to improve bilateral ties. Relations between the two Nato members have soured dramatically in recent years. Reports on Friday suggested Berlin was moving to approve a request from Turkey for German arms manufacturer Rheinmetall to upgrade its Leopard 2 tanks, to make them less vulnerable to explosives. The tanks are thought to have been used by Turkey against the Islamic State (IS) group in Syria. However, defence experts have claimed in German media that recent images from Turkey's "Operation Olive Branch" appear to show them being used against Kurdish groups. Politicians from both the left and right have spoken out against the tank upgrade deal, and asked the government to clarify its position on the Turkish offensive in the Afrin region of northern Syria. Norbert Röttgen, a member of Chancellor Angela Merkel's Christian Democratic Union (CDU) party and chairman of the parliamentary foreign affairs committee, said it was "completely obvious" that Germany should not provide the upgrades. He told BBC Radio 4's World Tonight programme the intervention by Turkish forces was "illegal, contrary to international law and counter-productive with regard to fighting ISIS". He said Turkey could not claim to be acting in self-defence because "there have not been any attacks on Turkey by Kurdish forces in Syria". Mr Röttgen praised the US for speaking out against the Turkish offensive, saying: "The Americans are the only Nato allies who are clear about what is happening. We quite often criticise the Trump administration but at this point they are more clear and more courageous than the others, and we should follow." German Foreign Minister Sigmar Gabriel said on Monday that he had called his Turkish counterpart to express concerns about the humanitarian impact of the Afrin offensive. Turkey's president has vowed to "crush" the People's Protection Units (YPG) militia, which controls Afrin and more than 400km (250 miles) of Syria's northern border. On Tuesday the United Nations said an estimated 5,000 people have been displaced so far in the clashes in the Afrin region.